This is a short form agreement when providing on-site or in-home computer repair and support services. impressed with the quality of the content for various contract templates." This On Site Computer Repair and Support (short) is included in editable Word format that can be customized in Word or by using the included Wizard software. 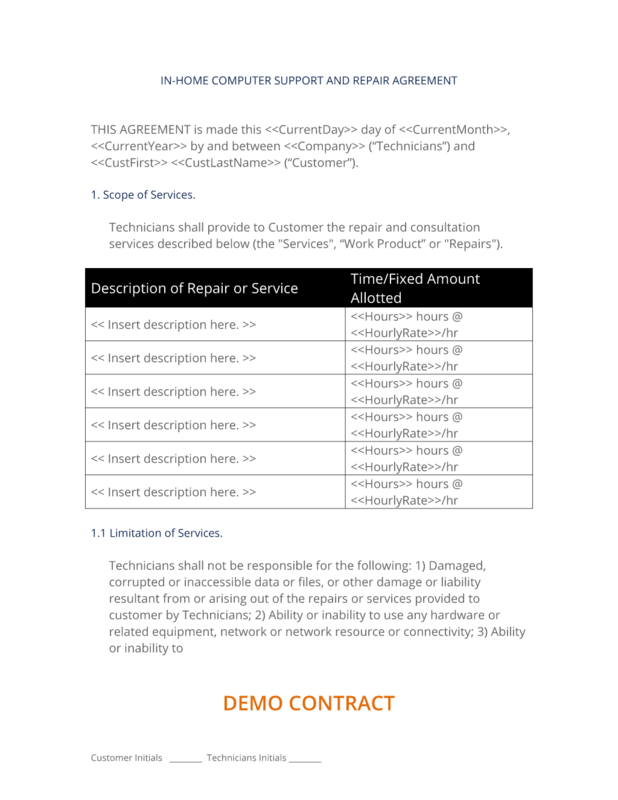 THIS AGREEMENT is made this Current Day day of Current Month, Current Year by and between Company Name ("Technicians") and First Last ("Customer"). Technicians shall provide to Customer the repair and consultation services described below (the "Services", "Work Product" or "Repairs"). Description of Repair or Service Time/Fixed Amount Allotted Insert description here. Customer waives any warranty, express or implied, for the services and repairs performed under this Agreement. Customer acknowledges that Technicians are not responsible for the results obtained by Customer when using any Services or Work Product produced by Technicians. Customer waives any claim for damages, direct or indirect, and agrees that its sole and exclusive remedy for damages (either in contract or tort) is the return of the consideration paid to Technicians as set forth in Section 1, Scope of Services. No action, regardless of form, arising out of the Services rendered or Work Product, under the Agreement, may be brought by either party more than one year after the cause of action has occurred. In no event shall Technicians be held liable for consequential damages. This Agreement contains the entire agreement between the parties relating to the subject matter hereof and supersedes any and all prior agreements or understandings, written or oral, between the parties relating to the subject matter hereof. No modification of this Agreement shall be valid unless made in writing and signed by both parties hereto. This Agreement shall be governed by and construed in accordance with the laws of the State of State. Exclusive jurisdiction and venue shall be in the County County, State Superior Court. The waiver by either party of any breach or failure to enforce any of the terms and conditions of this Agreement at any time shall not in any way affect, limit, or waive such party's right thereafter to enforce and compel strict compliance with every term and condition of this Agreement. In the event any party to this Agreement employs an attorney to enforce any of the terms of the Agreement, the prevailing party shall be entitled to recover its actual attorney's fees and costs, including expert witness fees. The complete On Site Computer Repair and Support (short) - with the actual formatting and layout - is available in this Contract Pack.